Pho (pronounced like 'fur' but without sounding the 'r') is the national dish of Vietnam. It's a soup of rice noodles and beef in an intensely flavoured beef broth. The Vietnamese eat pho at any time of day, especially at breakfast. The name is thought to come from when Vietnam was a French colony - pho is an Asianised version of the French dish pot-au-feu. The broth takes care and time to make, so make a large quantity and freeze any that you don't use within a week. You need a mixture of beef cuts (pho would originally have been made from leftovers and scraps), and a selection of bones - marrow bones are especially good. Pho is sometimes served with thin slivers of raw brisket that the diner poaches in the broth, so cut some off the brisket, and put any unused meat into the stockpot. Add 6 litres of cold water to a big pan, the meat and the bones to a big pan. Bring it to the boil. As it boils, scum will rise to the top, and you need to skim this off otherwise your broth will be cloudy. There are several ways to do this. An open flame is best, such as in a charcoal burner or gas hob. If using gas, place the vegetables on a wire rack above the flame. You could also do it under a very hot grill or directly onto an electric hotplate. Whichever method you use, this is the procedure: peel the onions and cut them into quarters or eighths - you want the layers of onion to hold together if possible. Place the cut edges on the heat and let them cook until blackened. Turn the chunks periodically until they are black all over. Do the same with the unpeeled ginger. Heat a small frying pan on medium heat and add the fennel seeds, star anis and cloves. Break the cinnamon sticks into small pieces and add those. Shake everything around a few times, and when they begin to release a spicy aroma, remove from heat. Once you have skimmed all the scum from the water and no more is appearing, turn the heat down low, add the onions, ginger, sugar, spices and pepper and leave it to simmer, stirring every half hour or so. After 2 hours, remove the meat and set aside. At this point, add 2 tbsps of fish sauce and a teaspoon of salt. Continue simmering for another 1½-2 hours. At the end of the cooking time, strain the broth through a colander lined with 2 layers of muslin cloth. Check the seasoning again, and add more salt or fish sauce if necessary. You can use the broth immediately, but I like to leave it in the fridge overnight. The next day, you'll probably have a layer of solid fat on top of the stock, and you can easily remove and discard this. Actually creating the pho soup takes almost no time at all. In a small saucepan, bring some of the broth to the boil (quantity depends on how many servings you are making, obvioulsy), and add some slices of the previously-cooked meat. Prepare the rice noodles according to the manufacturer's instructions (this usually involves simmering or soaking in hot or boiling water for a few minutes). Place some noodles into a bowl, and pour over enough broth to just cover them. Make sure each person gets 4-5 bits of meat. The pho can be served with any or all of the following: bok choi leaves, sliced spring onions, sliced red or green chillies, coriander (cilantro) leaves, mint leaves, wedges of lime, thin slices of raw beef. There's also usually a dipping sauce made from hoisin sauce with a little sriracha (hot chilli sauce) mixed in. If you are using the raw beef, pop it into the broth as soon as you get it, and it will cook in a couple of minutes. A squeeze of lime adds a wonderful freshness to the dish. The video above is from the Keef Cooks YouTube channel. 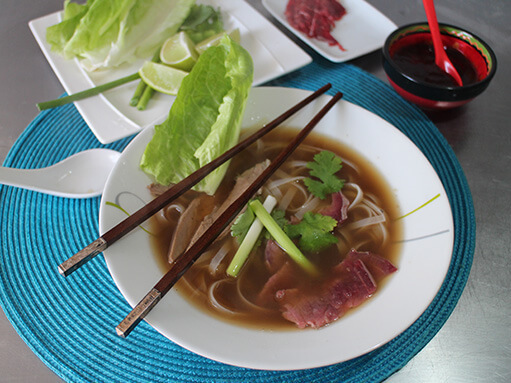 Click here to see the video recipe of Pho - Vietnamese Beef and Noodle Soup on YouTube. Total time: 4 hours 30 minutes.